boasting a launch site with a width of 1.5 kilometer and a maximum height of 450 meters. It is a rhythmical fusion of music and fireworks held at Seaside Momochi Beach Park, where Fukuoka Tower is located. This pyrotechnic display above the ocean is one of art in itself. 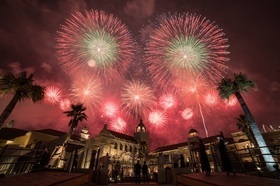 In particular, the grand finale of 5,500 fireworks fired over 6.5 minutes offers an impressive spectacle that fills the night sky. Come and enjoy this summer night fête of fireworks and music! 7:30pm Start time　9pm End time.